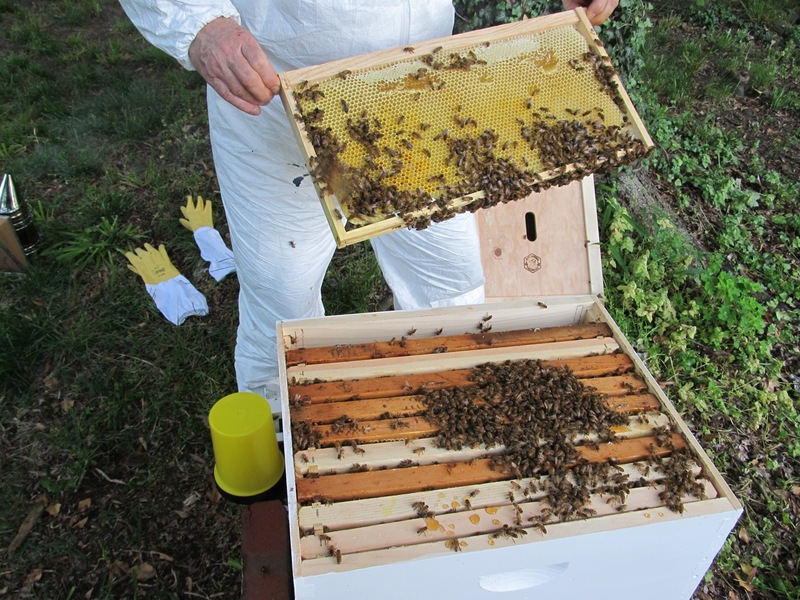 So at the end of April our bees (or "the girls" as we like to call them) arrived. 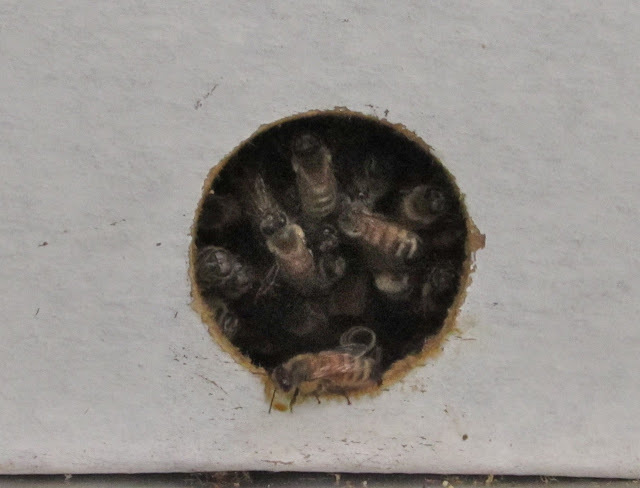 They were in a Nuc box, 5 frames full of buzzing activity! 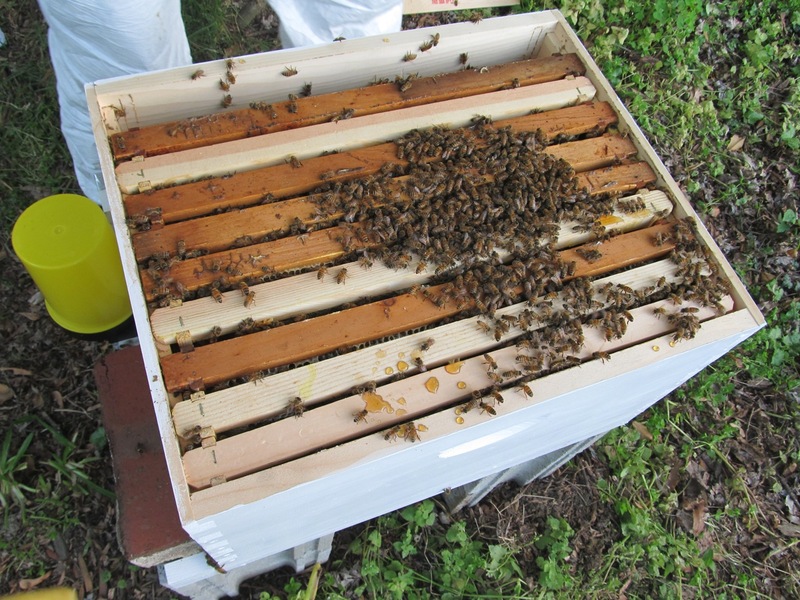 We let the box sit on top of the hive for two days so the girls could get orientated to their new home and by the afternoon of the second day they were already coming home loaded with pollen. Overall it went really well and putting my hands into all that buzzing activity was quite a rush! Sorry there are no pictures of the actual transfer...I was having too much fun! 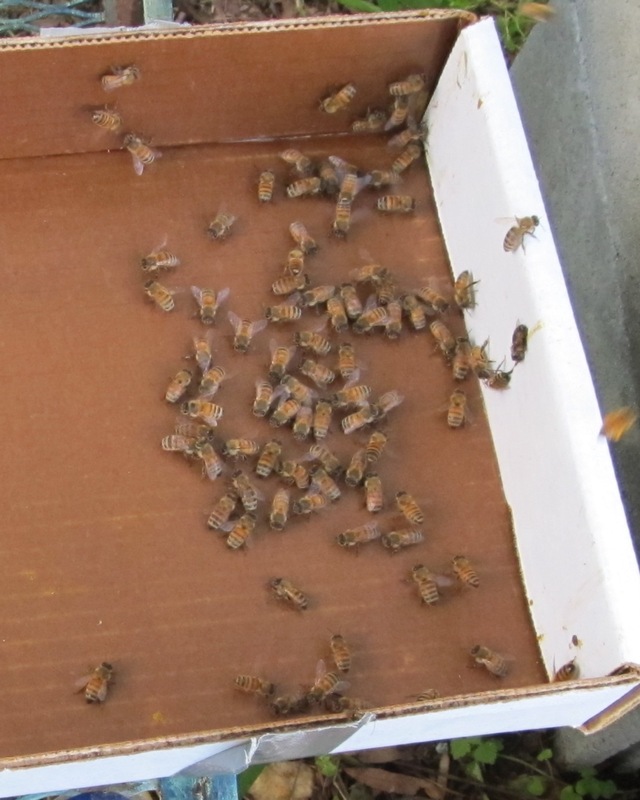 Here you see a few stragglers that didn't want to abandon the box...but they all made it into the hive overnight. 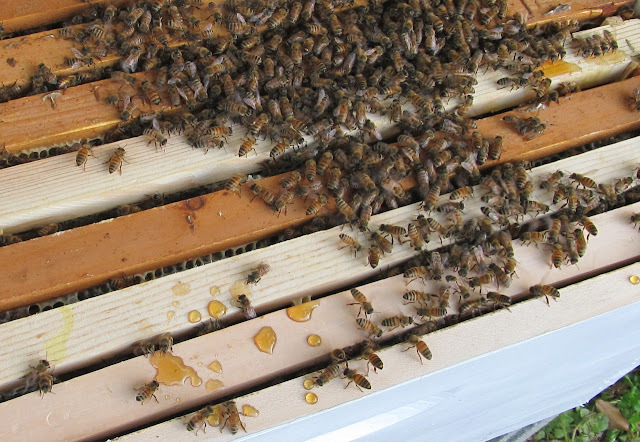 Skip ahead to one week later and we're ready to open the hive and see how things are progressing. Once again the smoker was an issue...yeah it doesn't LOOK hard does it? But getting smoke with no fire is harder then it appears. ...also note the hands without gloves? Not mine I might add. The little buggers have stung me twice already so I'm wearing every piece of protective clothing I can find! Luckily we had a super ready to go so that the girls have more room to do their thing. 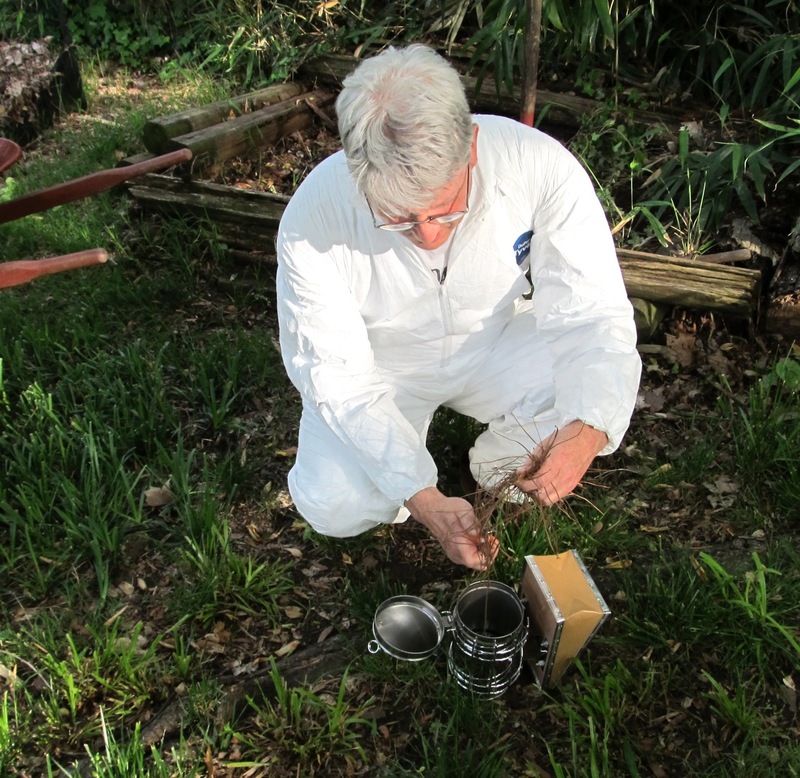 This weekend our experienced beekeeping friend is coming over to give us some much needed advice on things like..."how to spot the blasted queen in the milling throng" "what to do about nasty hive beetles" and "how many supers do they really need?" ...important stuff, I'll let you know how it goes! I think it is so interesting - beekeeping - in the garden. I saw a tw-show last week an I wanted to do it also, but not now I need more time. So I'm looking for your projekt and have big interest on it. 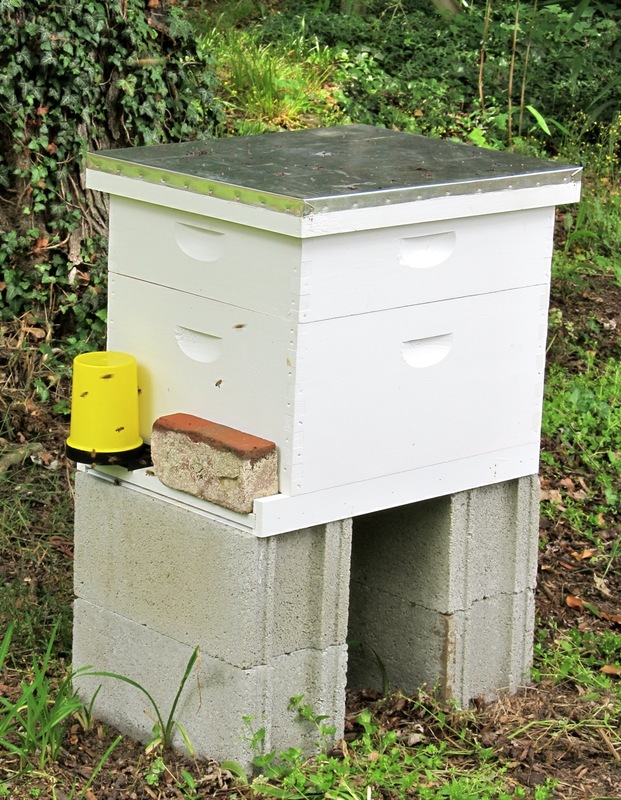 I would love to keep bees, but live in the kind of neighborhood where people would go nuts if I tried! Still,I am always happy to see people doing this! I'm so impressed! One of my friends here is starting to keep bees. I'm not ready to try it myself yet. I would love to have some bees, but I just don't think I could do it! 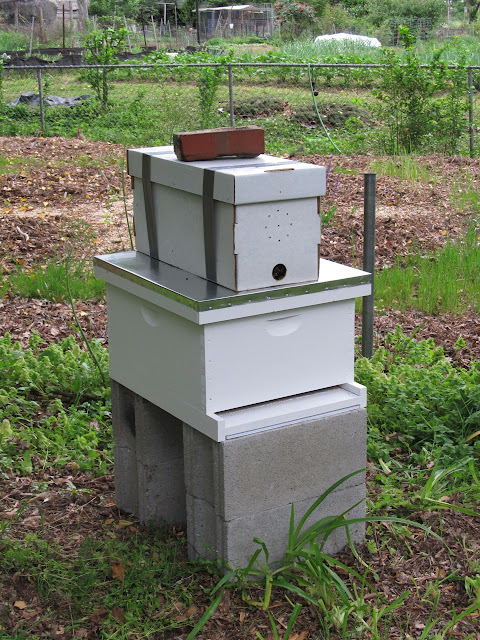 Look forward to watching your progress as a bee keeper!! You're braver than I. Very impressed!